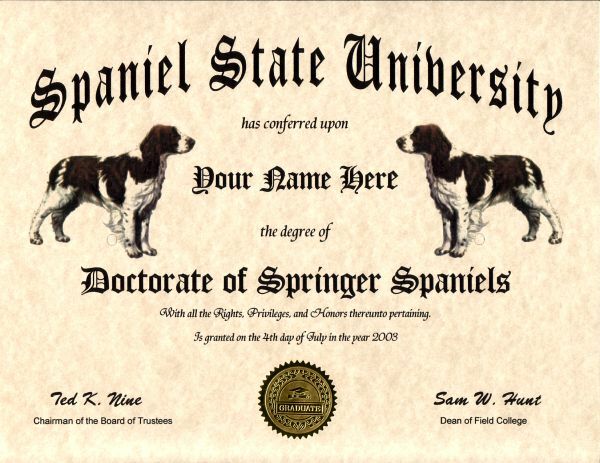 Unique and fun non-traditional Springer Spaniel doctorate diplomas. Don't you deserve a degree for the skill you posses? Now you can have one without ever stepping foot in a classroom. That's right, no expensive tuition, and no college loans to pay off. In just a few short days you, your friends, and your relatives can be admiring your Doctorate Degree. Show them all who has the real skills, and the Diploma to prove it.